KC Brains Cyber Crystal is one of the latest seed breeds. She is a mostly indica with all typical indicas qualities. 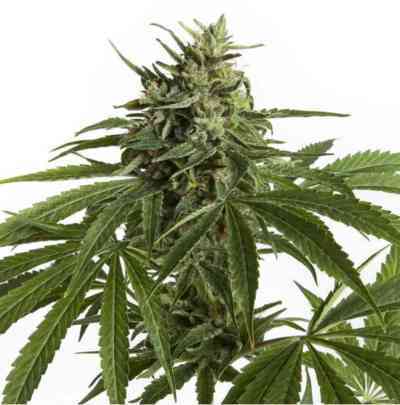 Seeds of this marijuana produce compact indoor plants of up to 120 cm tall which can stretch up to 2.3 m. high outdoors. Wherever you decide to grow your Cyber Crystal, she won't disappoint you. 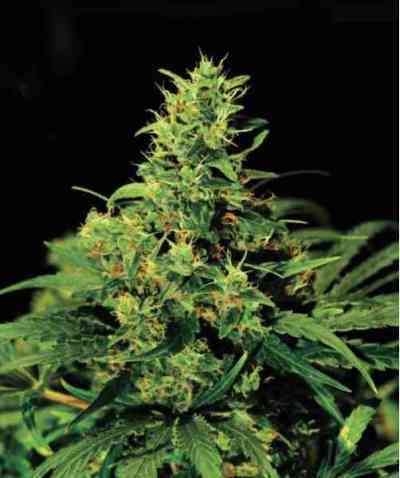 This thick, squat, central-cola dominant beauty situates her light green narrow leaves around a stem so well balanced that there is enough space and lights for buds to fully develop. When completely matured, they are quite big and heavy and coated in a bed of THC snow. That's how she got her name. Her short stature and fast flowering (8 weeks indoors) makes Cyber Crystal a painless grow for the lazy closet grower. Wherever you decide to place her, this resinous dwarf shows her full potential when the harvest time comes. 750 gr. per outside plant is average, and you can get more if you nurture her more. The harvest starts at the end of September and carries out through October. Sedative properties of Cyber Crystal cannabis seeds could be put to good use in large animal veterinary practices. She balances well an effect body stone with a happy little head high. It's recommended not to overdo it.